What does it mean to you to have run your own business for 30 years? Patricia: I came to Montreal (Quebec) in 1980. I came for a two-week visit, but destiny had other plans for me. I was to remain in Montreal for a long time. A local design firm really wanted me to work with them; they needed my kind of skills and assistance. I accepted. A couple of years later, another serendipitous event occurred, which resulted in the opening of Patricia McClintock & Associés Inc. design studio, which from the very early stages was focused on delivering hospitality projects. In reality, I never thought of how long it would last. I started and we have been busy ever since. It is others who remind me that it is fantastic that 30 years later, we are still in business with no intention to stop. I am grateful to have been able to run my business and to do what I like and enjoy for all these years. What is the #1 lesson you’ve learned and that you would pass on? Every day is a new challenge. Have the humility to address them one by one. A business is as good as its people. Surround yourself with dedicated people, that love their work and from whom you are always learning. Hang in there when the going gets rough and continue to always strive at providing the best service. Passion of your work, patience for all the various “Murphy law encounters”, gratefulness that opportunities are always around and for meeting great clients. Dedication and purposefulness in executing the work. What does Patricia McClintock & Associés provide its clients that other interior designers servicing the hotel industry don’t? Patricia: I know we are very dedicated to locating and finding the best design solutions for our clients, to assisting them in implementing and articulating their vision into financial successful realities. Also by being present through the entire design process, our aim is to develop a long term business relationship. You’ve worked on so many properties in and out of North America. What project(s) have been your favorites? Patricia: We offer all our clients the same dedication in assisting them with the implementation of their projects. All projects, even those that appear to be cookie cutters, have challenges which we like to tackle. However, projects that force us to step out of our comfort zone and do a lot of research are often more creative. 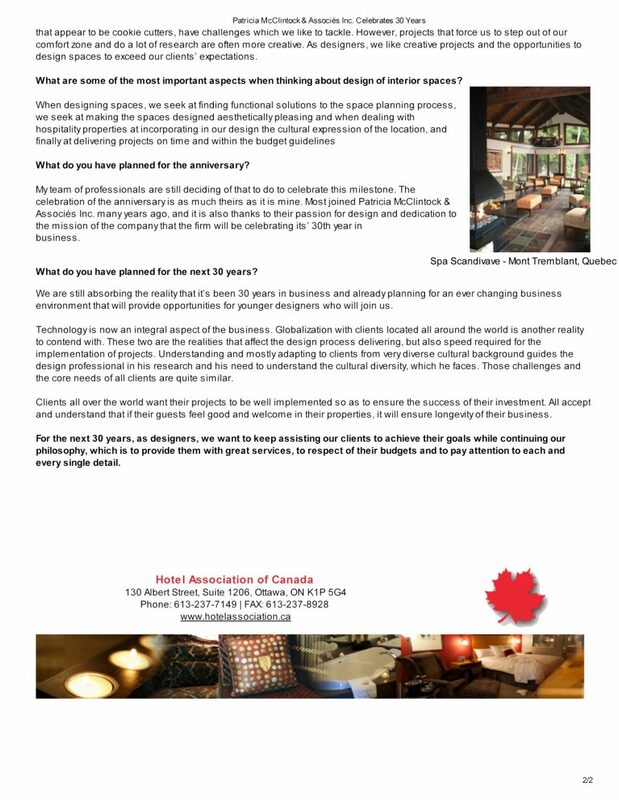 As designers, we like creative projects and the opportunities to design spaces to exceed our clients’ expectations. What are some of the most important aspects when thinking about design of interior spaces? What do you have planned for the anniversary? Patricia: My team of professionals are still deciding of that to do to celebrate this milestone. The celebration of the anniversary is as much theirs as it is mine. 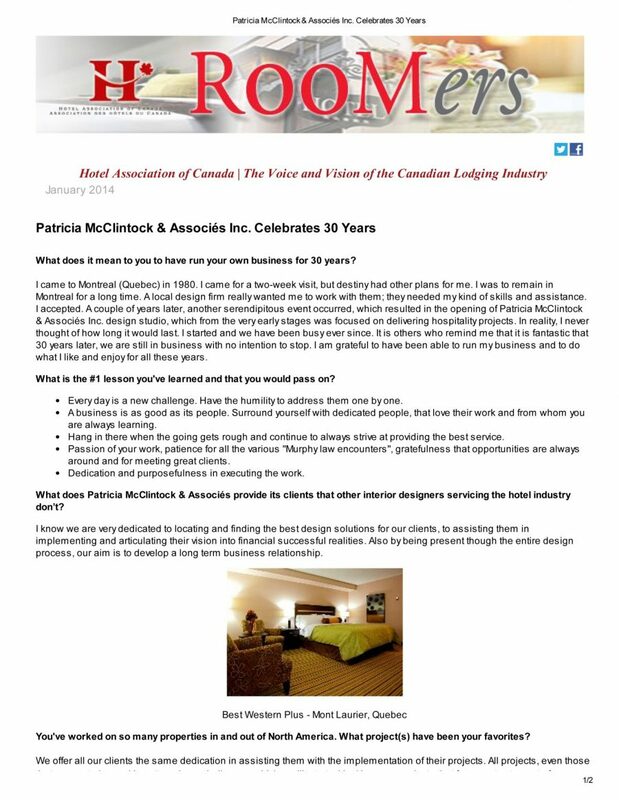 Most joined Patricia McClintock & Associés Inc. many years ago, and it is also thanks to their passion for design and dedication to the mission of the company that the firm will be celebrating its’ 30th year in business. What do you have planned for the next 30 years? Patricia: We are still absorbing the reality that it’s been 30 years in business and already planning for an ever changing business environment that will provide opportunities for younger designers who will join us. Technology is now an integral aspect of the business. Globalization with clients located all around the world is another reality to contend with. These two are the realities that affect the design process delivering, but also speed required for the implementation of projects. Understanding and mostly adapting to clients from very diverse cultural background guides the design professional in his research and his need to understand the cultural diversity, which he faces. Those challenges and the core needs of all clients are quite similar. Clients all over the world want their projects to be well implemented so as to ensure the success of their investment. All accept and understand that if their guests feel good and welcome in their properties, it will ensure longevity of their business. For the next 30 years, as designers, we want to keep assisting our clients to achieve their goals while continuing our philosophy, which is to provide them with great services, to respect of their budgets and to pay attention to each and every single detail.